Andrew is mentioned quite often in the gospels, but in a way that must have annoyed him: ‘Peter, and his brother Andrew…’. Always ‘and his brother Andrew’ following the name of the more high-profile Peter. You wonder if it ever bothered Andrew, or if he was used to being the tag-along. The truth is that Andrew had quite a different personality to Peter. He was less impulsive, more approachable, a man who thought quite deeply. He had educated Greek friends who respected his opinion. Some of them asked to meet Jesus, and Andrew introduced them to Jesus and his ideas (see James Tissot’s painting of the scene at right). He may have been something of a quiet intellectual among the group of people who formed Jesus’ core supporters. 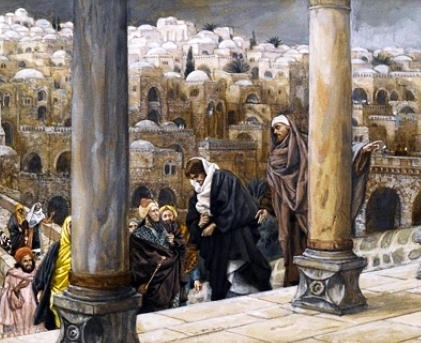 Andrew brings some Greeks to meet Jesus, painting by James Tissot His origins were humble. He was a fisherman who came from Bethsaida on the Lake of Galilee, but lived in nearby Capernaum. But the life of a fisherman does not seem to have satisfied him, for he was also a disciple of John The Baptist, the radical preacher in the desert, who told him about Jesus of Nazareth and called Jesus the ‘Lamb of God’. Andrew was a man looking for something more than the steady life of a fisherman. Intrigued, Andrew approached Jesus and soon became convinced Jesus was the Messiah. When Jesus later approached Andrew and asked him to join him in his ministry, Andrew readily agreed. It is surprising that the gospels do not make more of Andrew, because he was the first to whom Jesus ‘stated his case’. Jesus must have been fortified by Andrew’s belief in him when he underwent that life-changing event called the Temptation. Mosaic showing Jesus with Andrew and PeterAndrew was perhaps the first to spread the Good News. He brought Peter, his brother, to Jesus (John 1, 35-44). 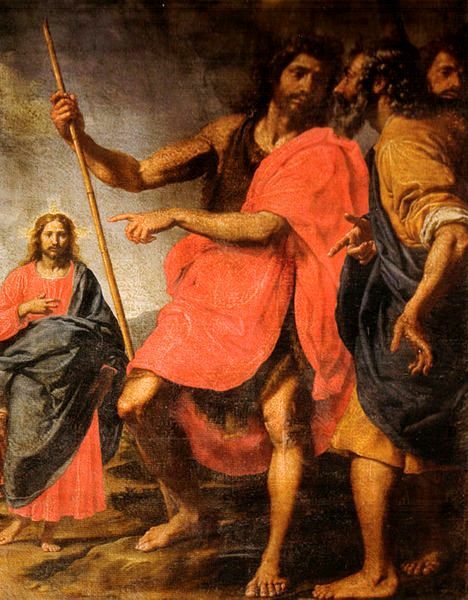 The first two disciples whom John reports as attaching themselves to Jesus (Jn 1:35-42) are Andrew and another disciple – whom John does not name, but who is commonly supposed to be John himself. Andrew then finds his brother Simon and brings him to Jesus. Because of this sequence of events, Andrew has been called ‘the Peter before Peter’ because he is the first (that we know) to bring others to belief in Jesus. What sort of person was he? Why was he among the first to follow Jesus? Because he had an enquiring mind. He was actively looking for the truth. He simply wanted to know. This is why he took Jesus aside on the Mount of Olives to ask when the destruction of the Temple would occur. Right from the start, Andrew appears to have been part of an inner circle among the disciples — only he and three others (Peter, James, and John) were on the Mount of Olives with Jesus when Jesus spoke about the coming cataclysm in Jerusalem: the destruction of the Temple and the apocalypse. Andrew was also practical, and a problem-solver. 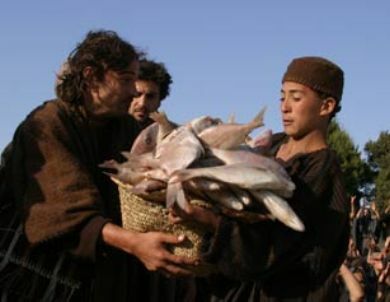 It was he who brought the boy with the loaves and fishes to Jesus (John 6:8) ‘Here is a lad’ he says ‘with five barley loaves and two fish.” (John 6:4-14). He also brought the enquiring Greeks to Jesus (John 12:20-26) in the tense hours before The Last Supper and Jesus’ arrest in the Garden of Olives. When a number of Greek Jews wished to speak with Jesus, they approached Philip and Andrew to introduce them to Jesus. 20 Now among those who went up to worship at the feast were some Greeks. 21 So these came to Philip, who was from Beth-sa’ida in Galilee, and said to him, “Sir, we wish to see Jesus.” 22 Philip went and told Andrew; Andrew went with Philip and they told Jesus. 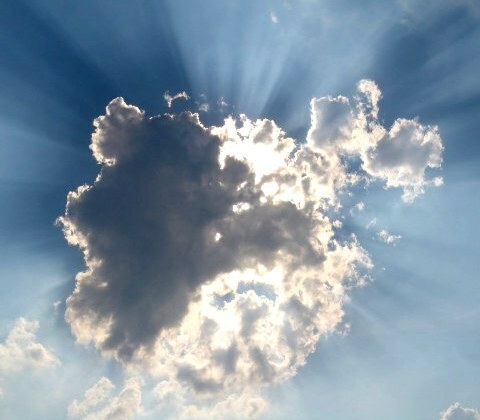 23 And Jesus answered them, “The hour has come for the Son of man to be glorified. 24 Truly, truly, I say to you, unless a grain of wheat falls into the earth and dies, it remains alone; but if it dies, it bears much fruit. 25 He who loves his life loses it, and he who hates his life in this world will keep it for eternal life. 26 If any one serves me, he must follow me; and where I am, there shall my servant be also; if any one serves me, the Father will honor him. This is an important point. Every time Andrew is mentioned as an individual, it is because he is bringing someone to Jesus. Like most of the other apostles, Andrew seems to have abandoned Jesus after he was arrested. But he returned, and was with the frightened group of disciples in Jerusalem after Jesus ascended to heaven. There is no mention of his death in the New Testment, but tradition has it that he was crucified at Patrae in Achaea on an X-shaped cross which has become the traditional St. Andrew’s cross. He had protested that he was unworthy to be executed on a cross that was the same shape on which Jesus died. It is said he took two agonising days to die. 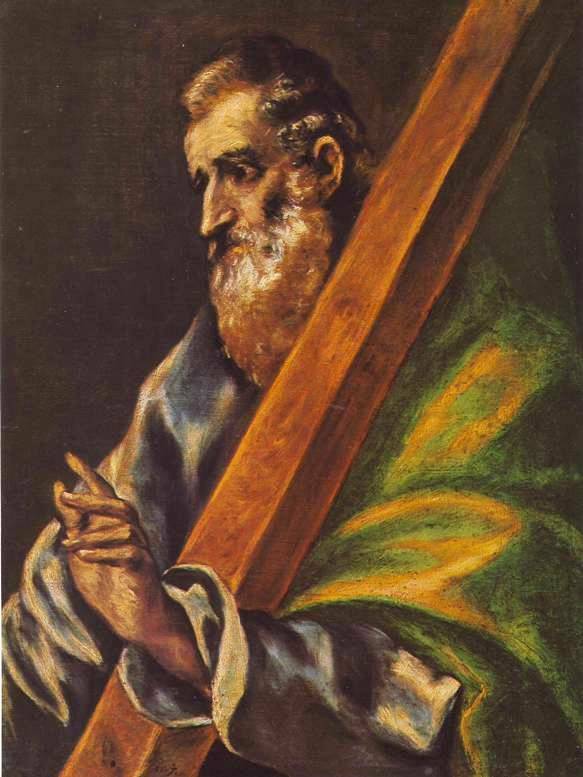 Beyond what is told of St Andrew in the New Testament, which tells that he was the brother of Simon Peter, that they were ﬁshermen from Bethsaida and that they also had a house at Capernaum, little is known of him. Accounts of his later life are fragmentary and not dependable. Legend relates that he travelled to Scythia, Cappadocia and Bithynia and was the ﬁrst to preach Christianity to the Muscovites in Sarmatia. At last he came to Achaia where the wife of the proconsul at Patras was one of his converts. This angered her husband and he ordered Andrew to be cruciﬁed on the shape of cross since then always associated with his name. 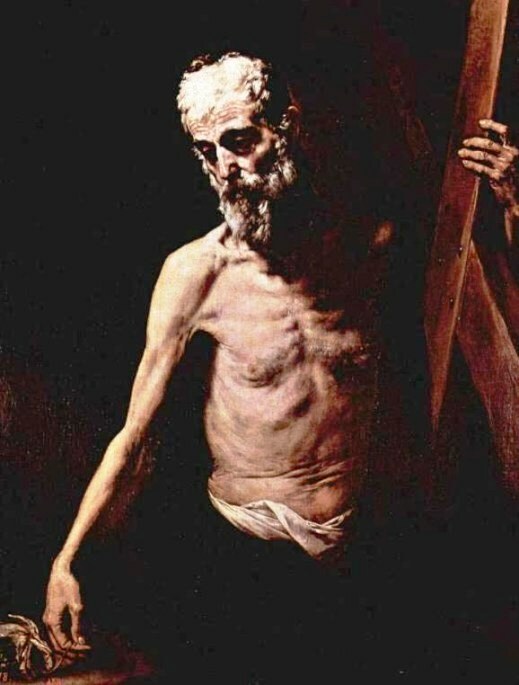 He was bound to the cross with cords and so lived two whole days, during which time he preached to his people urging them to remain steadfast to the faith. His connection with Russia is based on a tradition that he reached as far as Kiev. Legend also associates him with Scotland. It says that in the fourth century the guardian of the relics at Patras was told in a dream to take part of them to a place which would be shown to him. He was led to what is now St Andrews in Scotland, where he built a church. 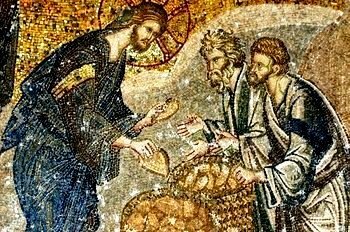 The rest of the alleged relics were stolen from Constantinople in 1210 and taken to the Cathedral of Amalﬁ near Naples. In 1462, Pope Pius II transferred the head to St Peter’s, Rome.